Camping is by far the best way to see the Australian Outback, but if you only rely on the caravan parks in towns and near the big tourist attractions you will miss out, and waste a lot of money! Get an Australian camping guide book that tells you about the kazillions of free campsites in this wonderful part of the world! That's right, in much of Australia and in particular in the Australian Outback bushcamping is free. On this page you can find the best and the most popular Australian camping guide books. The first time I saw her guide I opened it and checked out what she wrote about the area that I live in. Since it's one of the remotest corners of the whole Australian Outback I didn't expect to find much detailed info. I couldn't have been more surprised! Everything is there, I mean everything. You will find all the free campsites along the main highways listed, campsites within national parks and near tourist attractions and more. They are not just listed, she describes everything in great detail, the views, how dusty or shady or crowded, the facilities and, if applicable, fees. But that's not what makes her books so special. Jan goes well beyond the usual places. The only way to find out about many of the campsites she lists is to get really friendly with the locals. She covers all our secret places that usually no tourist finds! She gives you precise descriptions on how to get there, and if it is a 4x4 track she tells you exactly how difficult. Not just saying easy or medium, but telling you exactly how many metres from the sweeping right bend that tricky sandy spot is, or that you should stick to the left side of the track after the top of the hill because of that wash out that you won't see in time otherwise, and so on. There are mud maps and GPS coordinates for all places, detailed descriptions of all the sites, like where the best shade trees are and how to get down to the creek for a swim. Heck, she even tells you what fish you can catch there for dinner! Dog owners will also love these books because pets are allowed at most sites! Jan really knows her stuff. She must have spent years travelling and camping in Australia to put this info together. Needless to say that some of the locals aren't too thrilled about all the information she gives away. I was thrilled and I can guarantee you will be, too. I wouldn't go camping anywhere in Australia without her book on the dashboard of my car. Period. The other downside is that to date her books are only available in Australia. If you live overseas you can either wait until you get here to buy them, or you can order them here and have them sent to you. If you live in Australia you can go for a stroll down to your next Angus & Robertson book store, or you can buy them online through "Buy Australian". I am sorry, but Jan has retired and her great books are not being published any more! Your only hope is to get hold of a used copy somewhere somehow. 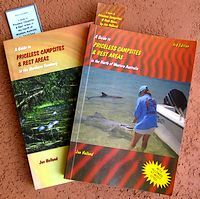 There are two reasons why you may want to buy other Australia camping guide books than Jan Holland's, or in addition to her books. One could be that you don't really want to leave the beaten track and prefer to stay in caravan parks in or close to cities or towns (and sometimes you just have to). The other reason is that you will most likely also want to travel in the Australian states that she doesn't cover. Sorry, here too I had to remove the links to the Australian online store I was recommending as it does not exist any more. I will find a new one. Until then, just do a search online or check your favourite real world bookstore! This is a "don't leave home without it" book for anybody who wants to discover Australia with a campervan or caravan. The authors spent 12 years (!) travelling with their caravan to put this information together. 35'000 km of touring routes, over 600 campsites, info on choosing the right vehicle, tips for caravanners, recommended experiences... It comes with a comprehensive atlas, and they really cover every corner of it. This one is aimed at a younger and more adventurous crowd. In addition to the info on the campsites Craig and Cathy also include a lot of good information about national parks, about permits you might need, costs and facilities. And they give tips on what to do once you get there... Camping in Australia covers well over 2500 campsites!